Before getting into the conversation, I want to thank the anonymous listener who sent us three books from our Amazon wish list last week. Whoever you are, I hope you hear this message so that you will know how happy the books made me. Thanks so much! OK, let’s get on with today’s conversation. Lori: When I was over in the States recently, I was reading one of my mom’s magazines. And in that magazine I read about a new hamburger. Michael: What… Can I just stop you there? What is sharp cheddar cheese? Lori: Sharp cheddar cheese? A sharp cheese is a cheese that has a strong flavor. Lori: So cheese can be mild or sharp. Lori: You’d think that the opposite would be “dull,” but you don’t talk about a dull cheese. Lori: Yeah, a blunt cheese, right, exactly. Exactly. So sharp cheddar cheese. But anyway, back to the burger, it’s got…yeah, a big beef patty, sharp cheddar cheese and two slices of bacon. And now here is the key. Michael: Mmm, the bacon sounds good. Lori: Yeah, but the key ingredient…the bun is actually a KrispyKreme glazed donut. Lori: Can you believe that? And it’s actually a baseball team, I think, the Gateway Grizzlies, it’s what they’re calling “Baseball’s Best Burger,” and they’re serving it at their baseball games. Michael: Baseball’s weirdest burger, maybe! Lori: Baseball’s most artery-clogging burger. Lori: Mmm hmm. A donut, yes. Michael: Is that, um, I mean, donuts are sweet though, aren’t they? Lori: Yeah, it’s a glazed donut so it would be sweet. And apparently they cut it in half and toast it and use that as the bun on this burger. Lori: It..I couldn’t…I thought it was a joke when I first read about it. I thought it must be a joke but apparently it’s true. Michael: It really makes me wonder, you know, they have this, um this kind of, stereotype of American people being fat. Michael: And I guess if, you know, they’re eating things like that whilst sitting down at the baseball game. Lori: Yeah, sitting down watching other people do sports. Michael: Exactly…that’s what I’m thinking, yeah! Lori: Right.I just wonder, how would someone even come up with that, the idea of using a donut as a hamburger bun. Michael: Well, there is something that you can, I mean, being an American you can tell me if this is true or not, I remember hearing about sandwiches that Americans like, and it’s peanut butter and jelly. Michael: Well, what you call jelly, isn’t that what we [British English speakers] would call jam? Michael: So peanut butter and jam. So it’s the savory peanut butter, salty, peanutty tasting butter and something like sweet strawberry jam. Lori: Yeah, but I guess it’s kind of like putting pineapple on your pizza. You know, some people think that’s just an aberration. But there’s something about the sweet, tart pineapple combined with the salty, savory ingredients of a pizza that is actually…I like it. Michael: Well, I guess it’s like having gammon and pineapple, you know, the thick cut of ham which is also salty. Lori: Yeah, or pork chops and applesauce. Lori: But you see, the thing is that in the States the peanut butter most people buy is actually slightly sweet anyway. It’s only natural style peanut butter that is just, you know, peanuts and salt with nothing added. Lori: Oh, that’s got sugar in it, definitely. It’s slightly sweet; if you just taste it on its own you can taste that it’s slightly sweet. Lori: If you compare it with the taste of natural peanut butter that’s just peanuts and salt, you’ll really taste the difference and taste how sweet the normal peanut butter is. Michael: I’m thinking, if you can combine something like peanut butter and jam, then combining a hamburger with a donut doesn’t seem so strange. Michael: Well, yeah, it’s pretty loony. Lori: Yeah, loony. I couldn’t believe that when I read that story in my mom’s magazine. But I went on the Internet and had a look, and there were people saying that it sounds disgusting and looks disgusting, but actually they were quite tasty, so what do I know? Michael: I can’t even begin to imagine what it would taste like. You know, I have no frame of reference. 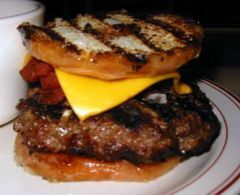 My taste buds cannot picture it, you know, I have an image of a donut in my head and an image of a nice juicy hamburger with a couple strips of bacon on. And forget the cheese because I hate cheese as you know, but the hamburger with bacon, that’s something that…in fact we should cut this podcast short right now because I want to go to the store and get some bacon and some bacon and some hamburger because I’m getting hungry now. Lori: Sounds like a plan, but let’s ix-nay on the donuts. Michael: Right, yeah, Hold the donuts! Thanks for listening to this episode of Real English conversations. And if you haven’t done so already, make sure to check out the show at www.china232.com. I’m sure you’ll like it! See you next time! (Informal American English) you can say that something takes the cake if it is something that you think is very surprising or annoying. Sharp is a word to describe the strong taste of certain foods, such as cheese. Cheeses range from sharp (strong) to mild (not strong). 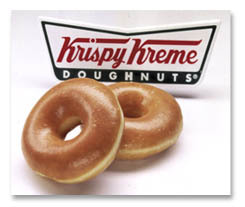 A glazed donut is a type of fried pastry covered with a thin coat (glaze) of sugary icing. To come up with something means to invent it or think of it. Food that is savory is salty, meaty, or spicy, not sweet. In British English it’s spelled savoury. An aberration is something that differs from the normal state of things, particularly the normal standard of morals or taste. Gammon is also called ham. It is meat from the back leg of a pig, usually preserved with smoke or salt (or both). Lori is using Pig Latin to play with the word nix. Nix is an informal word that you can use for negation (no, nothing, not, etc. ).